With wedding season comes the great responsibility of rocking every outfit at every function. And with those outfits, come huge bills and financial depression in your bank account. But worry not. We have a stunning fix for this problem! 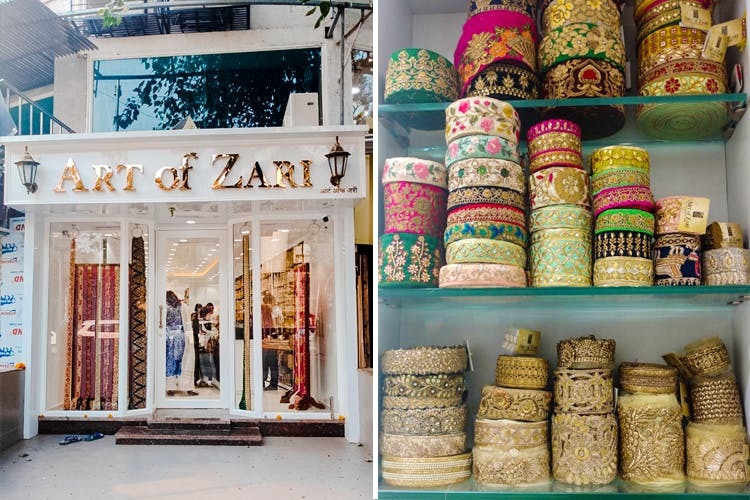 Art Of Zari in Khar has a treasure of wide varieties of lace, patchwork, latkans and bead buttons; all handmade by their own karigars. From all-gold to all-pearls, you name it and they have it. The moment you enter the store, you’ll be greeted by a wide variety of lace and borders, which start from INR 3 (yes, you read that right!) and go up to INR 600. Beautiful patchworks of Zari start from just INR 23 and go up to INR 1,500. Apart from that, they have a huge collection of ornamental hangings (latkans) which start at INR 20. Each and every piece is handmade and has a custom design. You can also get a plain fabric embroidered with Zari work with whatever designs you want. The charges start from INR 1,800 and go up to INR 5,000. You can take your stitched outfit and get it embellished with gotas and patchwork, or get the embroidery done. You can also take an unstitched cloth to get the design done and then give it to a tailor for stitching. If you have chosen the borders and buttons for your outfit, they’ll stitch it on the cloth and then give it to you. Instead of searching for an expensive dress, get yourself a plain ghagra or kurti and embellish them with the Art of Zari. The store practically has a new collection every week, so you are bound to stand out in a crowd.